The holiday season is upon us. The traditional turkey and ham is expected yet if you have multiple parties, it can get a bit boring. Want to shake it up? Here is a delicious recipe you can make in your crockpot. BBQ chicken and homemade sauce can be a true delight. Couple it with some roasted vegetables, corn and tossed salad. Your guests will enjoy the taste and thank you for making something healthy. You can even go one step further. Purchase some mason jars and send your guests home with a jar of your homemade sauce. After all, it is the season for sharing gifts. 1. Place chicken breasts, whole, in a crock pot and add diced peppers and onions. 2. Pour broth over to cover chicken. Cook for 8 hours on low heat. 3. Strain off broth, peppers and onions. 4. Shred the cooked chicken; it will pull apart easily. 5. Add prepared sugar-free barbeque sauce and cook for 1-2 more hours on low. 1. Heat oil in a 1-quart saucepan over medium heat. Add onions and stir until tender, about 5 minutes. 2. Add remaining ingredients and whisk until smooth. 3. Bring to low boil, cover, reduce heat, and simmer with lid ajar to reduce splattering, stirring periodically until mixture thickens, 20 to 30 minutes. 4. Pour into wide-mouth glass jar, allow to cool. Cover and refrigerate. Use within 2 weeks or freeze. 5. 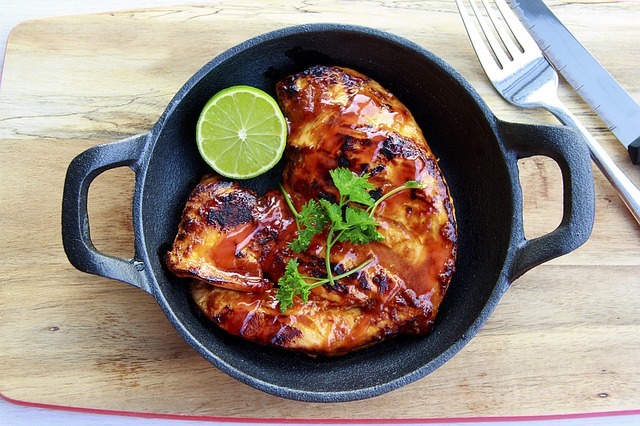 Serve chicken in a skillet and garnish with lime and parsley for a culinary effect!